The largest poll ever conducted on assisted dying has found that 84% of people in Great Britain support a change in the law. A survey of more than five thousand people from England, Wales and Scotland said they would support a change in the law to allow terminally ill, mentally competent adults to have an assisted death, provided they met strict upfront safeguards. The poll, conducted by Populus, found that support for assisted dying has increased from 82% since their last survey in 2015, and that support is consistently strong across demographics including gender, age, social grade and region. There is even stronger support for assisted dying for terminally ill people amongst people who stated they had a disability, while there is broad support for assisted dying across most faith groups, including more than 82% support amongst Christians. When asked whether they would feel more or less favourably towards an MP who was supportive of assisted dying, more than half of respondents said they would feel more positively, and only 6% said they would feel more negatively towards an MP who voted in support of law change on assisted dying. The news comes just two weeks after the Royal College of Physicians decided to adopt a neutral stance on assisted dying following its own survey of members, and a week after New Jersey became the eighth state in the USA to permit choice at the end of life. Noel Conway, 69, from Shropshire, has terminal motor neurone disease and recently brought a legal case challenging the blanket ban on assisted dying. Ann Whaley, 76, from Buckinghamshire, faced a criminal investigation after police were made aware of her plan to accompany her terminally ill husband Geoff, 80, to Dignitas in February 2019. Ann has requested a meeting with David Gauke, the Secretary of State for Justice, asking him to look into the problems the current law causes for dying people and their families. “This poll confirms that assisted dying has huge public support in the country, with five out of every six Brits wanting a change in the law. In these divided times, there is a cause that unites the vast majority of the country and that is seeking a more compassionate law for dying people. For further information and interviews with representatives of Dignity in Dying, please contact Ellie Ball at ellie.ball@dignityindying.org.uk / 0207 479 7732 / 07725 433 025. Populus interviewed a random sample of 5,695 adults online between 11th March and 24th March 2019. Interviews were conducted across Great Britain, with an increased sample level in Scotland, and the results have been weighted to be representative of all British adults. The last major assisted dying poll, conducted by Populus in 2015 of 5,018 adults, found 82% of the public was supportive of a change in the law on assisted dying. The full results can be accessed here. His condition is incurable and terminal, and Noel feels that he is prevented from exercising his right to choice and control over his death under the current law and fears that he may be forced to suffer against his wishes. The High Court and the Court of Appeal both reaffirmed that cases of this nature can be decided upon by the Courts, enabling future cases to have an easier passage. The Courts also confirmed that the ban on assisted dying is an interference with the right to respect for private life, as protected by the Human Rights Act. Although Noel’s case was denied a full hearing at the Supreme Court in November 2018, the judgment acknowledged that assisted dying is an ‘issue of transcendent public importance’ and ‘touches us all’. Geoff Whaley, 80, from Buckinghamshire, was diagnosed with motor neurone disease in December 2016. In December 2018, Geoff was given a prognosis of six to nine months. In February 2019, Ann was questioned by police after an anonymous call to social services alerted them of her plan to accompany Geoff to Dignitas for an assisted death. The investigation was eventually dropped, but it could be reopened if new evidence comes to light. On the day of his death at Dignitas on 7 February 2019, an open letter from Geoff was sent to all MPs, urging them to change the law on assisted dying. 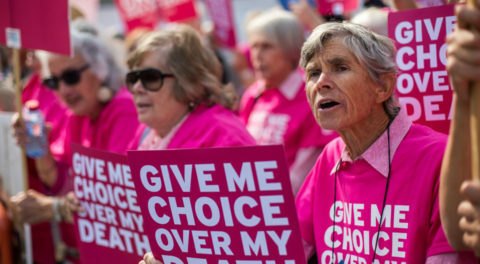 Assisted dying as an option for terminally ill, mentally competent adults in their final months of life is legal in eight US jurisdictions: Oregon (1997), Washington, Vermont, Montana, the District of Columbia, California, Colorado and Hawaii (January 2019). An assisted dying Bill passed in the New Jersey Assembly and Senate on 25 March 2019 and is now awaiting the Governor’s signature. Dignity in Dying campaigns for greater choice, control and access to services at the end of life. It campaigns within the law to change the law, to allow assisted dying as an option for terminally ill, mentally competent adults with six months or less to live. Estimated using publicly available figures from Dignitas and figures supplied through private correspondence with the Life Circle (Eternal Spirit) facility. The True Cost: How the UK outsources death to Dignitas – Dignity in Dying, November 2017.